YamiPod is a freeware application to efficiently manage your iPod. It can be run directly from your iPod and needs no installation. 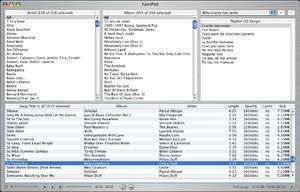 It also has extra features such as rss news and podcast support, remove duplicates, easy notes editor (with multipage support), songs synchronization, playlists export and much more. It has been translated in 12 languages. Version 1.8 is a freeware program which does not have restrictions and it's free so it doesn't cost anything. For security reasons, you should also check out the YamiPod for Windows download at LO4D.com which includes virus and malware tests. Additional screenshots of this application download may be available, too.